As a co-operative, the school excels because of the participation and enthusiastic support of our members. Parents participate in the running of the school. Our goal is to broaden each child’s learning experience through play, music and crafts. Individuals learn to co-operate with others, make friends, understand differences, share thoughts and toys, and take pride in their unique accomplishments. 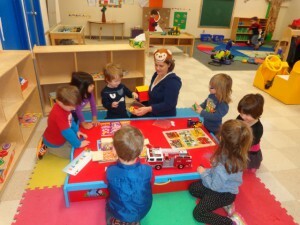 Attending a preschool eases the transition into kindergarten. Our teachers are always patient and accommodating with students and parents dealing with the challenges of separation anxiety and any other challenges the children may be facing. The Glen Cairn Co-operative Preschool Inc. was conceived in 1968 for a thriving young community by educator and resident Angela Kilby. With the help from neighbourhood families, fund-raising was initiated, equipment was built and donations of toys and books were received to start the preschool. In September of 1969, the doors opened for a school completely run by parent volunteers. The permanent home of the school is located in the downstairs of the Glen Cairn Community Centre.